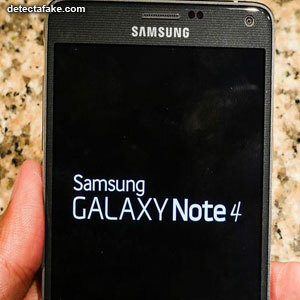 The Samsung Galaxy Note 4 was released globally in October 2014. 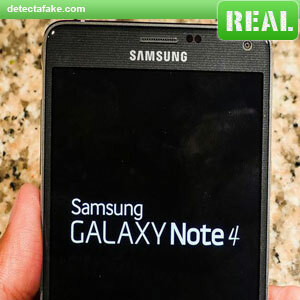 Replica Note 4 knock offs hit the market shortly after. Below are a few steps to avoid getting stuck with one of these poor imitations. The first thing to look for is overall quality and function. If you see any quality issues, hardware or graphical, beware. You should be able to swipe from screen to screen without hesitation. 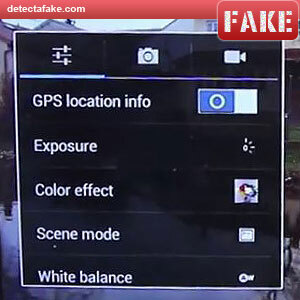 If it hesitates, It may be a fake. Next, check the boot up time. 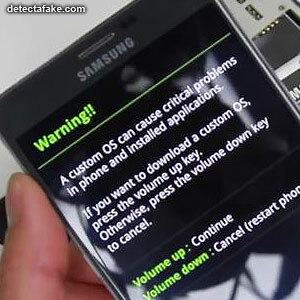 The authentic Note 4 should boot up in 10-12 seconds. 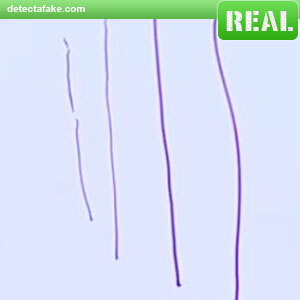 The fake version takes about 30 seconds or more. Next, look at the screen display while booting up. The authentic Note 4 will have the Samsung logo animated and then go to the screen above/left, before going to the home screen. 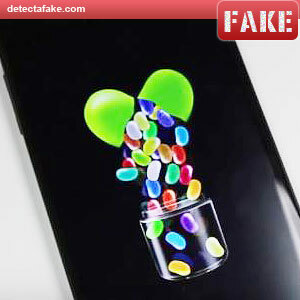 The fake version often has some Android graphic or in this case, Jelly Bean graphic as shown in the above/right photo. Next, look at the charge percentage on the status bar. Notice on the real one above, all the items on the status bar are the same color. On the fake above, the charge percentage is blue and the battery icon is green. Next, look at the power/sleep button. It should be either white or black, depending on the phone color. Many of the fakes are silver. If you see silver, assume it's fake. Next, look at the flash lens. 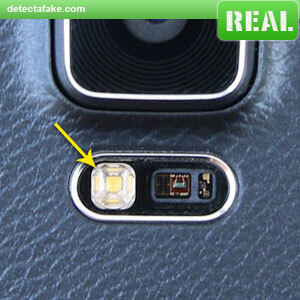 The real Not 4 has a square looking flash with a chrome like frame around it. 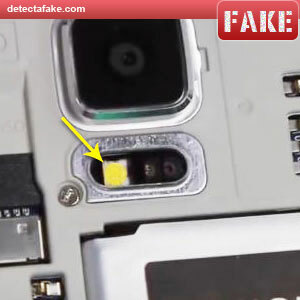 The fakes often have just a yellow circle looking flash. Next, look at the wall adapter. 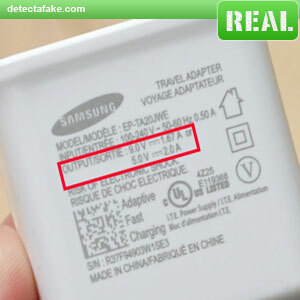 The genuine Note 4s have a 9 volt output. 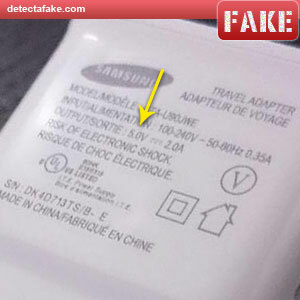 Many of the fakes have a 5 volt output. Next, look at the S-Pen. 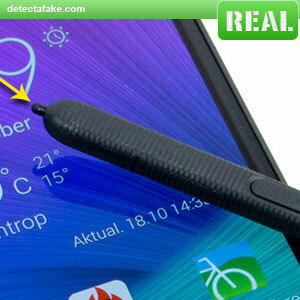 The tip of the S-Pen should be spring loaded and should easily press in when pressed against the screen. 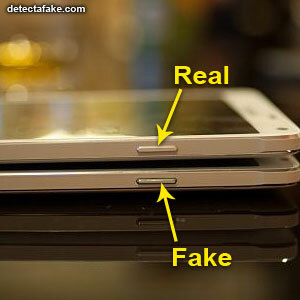 Many of the fakes do not press in at all. They are basically just a stylus, not an S-Pen. 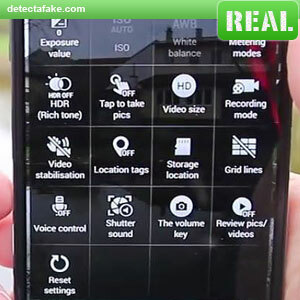 Next, look at the camera menu screen. 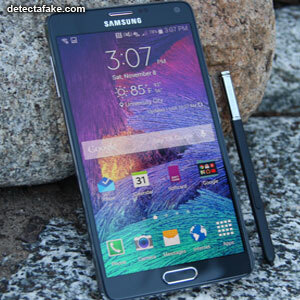 The genuine Note 4 should look like the real one above, with an assortment of square buttons. 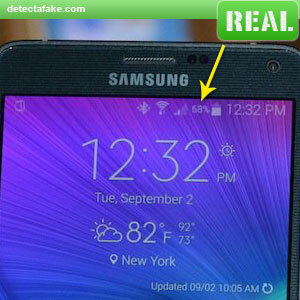 Notice on the fake above, the menu is quite different. 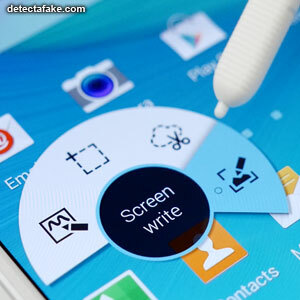 Next, press the S-Pen to the main screen. When it touches the screen, the sub menu shown above should pop up. If it doesn't, it's probably fake. Next, go into the "Note" mode from the sub menu. With the S-Pen draw lines with different pressure. Light pressure should draw thinner lines than heavy pressure. 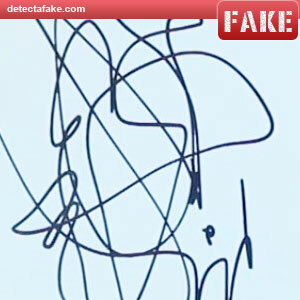 Notice on the fake above, the lines are thick, no matter what pressure is used.